Stir together the mustard and Merlot Wine Jelly Lay tortillas flat on a clean work surface. 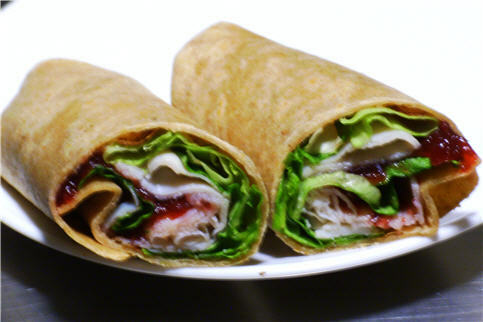 Drape two slices of turkey on lettuce; cover turkey with 2 tablespoons Wine Jelly/Mustard sauce, . Top with cheese and other half of 1st torn lettuce leaf. Repeat process for second wrap Assemble wraps by folding in both sides, next bring the bottom of each tortilla up over the filling, tuck the side edges again and roll to close.